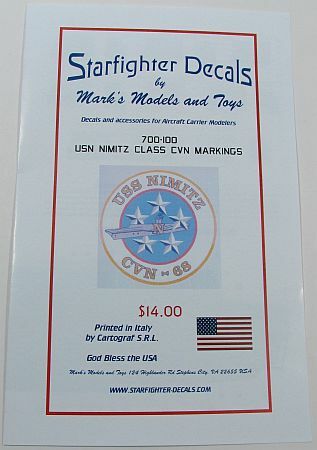 This release from Starfighter Decals in 1/700 for the Nimitz class of aircraft carriers contains deck markings for one complete kit and optional decals for every Nimitz class in the US Navy. The sheet is designed to complement their air wing marking sets and replaces every ship specific Nimitz class decal sheet in the Starfighter inventory. Previous sheets were ALPS-generated – this one is excellently printed by Cartograf in Italy. So decals are printed exceptionally well and are in register. 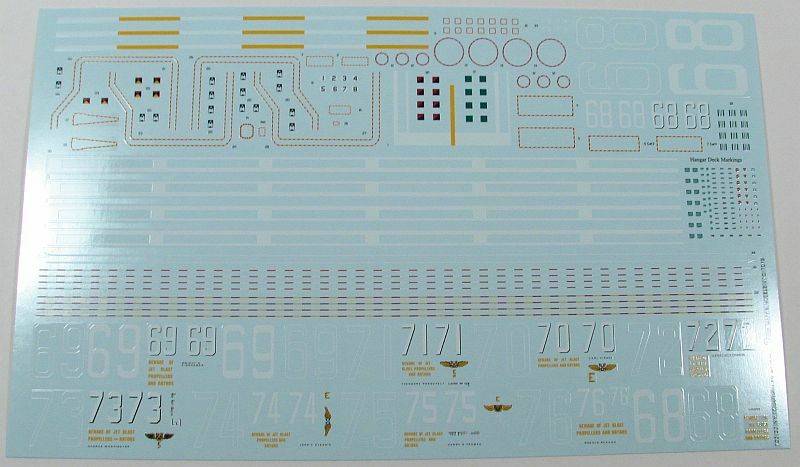 If you're looking for new decals for either your 1/720 or 1/700 Nimitz class aircraft carrier, then you'll want this set of decals. Add Starfighter's air wing markings sets and you have a lot of decals for a completely decked-out (no pun intended) Nimitz class ship. Thank you to Starfighter Decals for sending this review sample.